Given his family’s long-standing involvement in the arts, it’s hardly surprising that French-born curator and gallerist Philippe Hoerle- Guggenheim would eventually find himself immersed in the art world, too. His mother and grandmother were avid collectors, and his distant relative Solomon R. Guggenheim founded the eponymous Frank Lloyd Wright-designed landmark museum on Fifth Avenue, housing a continually expanding collection of modern and contemporary art since it opened in 1939. But Hoerle-Guggenheim, who started his career in New York in finance, approaches contemporary art from his own multifaceted perspective. "For me, its always important to find artists who produce very unique works and have ideas that are totally relevant to the present time", he explains. 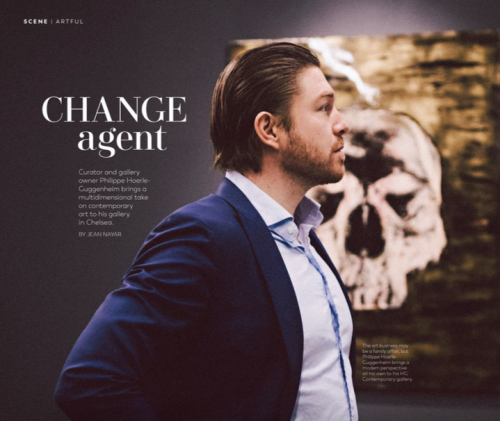 Diverse artists such as Tim Bengel (aka the Sand Master), who works with sand and gold leaf, the 16 year old painter Autumn de Forest who was appointed by Michelle Obama to the Presidents Committee for the Arts and Humanities, and street artist Retna, whose works Hoerle-Guggenheim showcases at HG Contemporary- the Chelsea gallery he opened in 2014- are a case in point. True to his roots in business, however, he also looks for ways to break infrastructural ground in the art market by engaging in activations and events with high-minded brands like Aston Martin or Edition hotels. "There's so much room for improving how the business works- from managing inventory to advising on pricing- especially in the digital age." he says. So in addition to hosting rotating exhibitions for his stable of international artists and occasionally offering up blue-chip secondary market works by icons like Andy Warhol, Picasso and Robert Rauschenberg, he also collaborates in unique alliances with about 45 independent artists, Doug Menuez, who followed Steve Jobs and a tribe of innovative entrepreneurs for more than 15 years to document the ways in which these visionaries changed our world. A selection of his photographs are on display at the gallery in an exhibition called Fearless Genius from January. 11 to Feb. 4. Given his family’s long-standing involvement in the arts, it’s hardly surprising that French-born curator and gallerist Philippe Hoerle- Guggenheim would eventually find himself immersed in the art world, too. His mother and grandmother were avid collectors, and his distant relative Solomon R. Guggenheim founded the eponymous Frank Lloyd Wright-designed landmark museum on Fifth Avenue, housing a continually expanding collection of modern and contemporary art since it opened in 1939. But Hoerle-Guggenheim, who started his career in New York in finance, approaches contemporary art from his own multifaceted perspective. True to his roots in business, however, he also looks for ways to break infrastructural ground in the art market by engaging in activations and events with high-minded brands like Aston Martin or Edition hotels. "There's so much room for improving how the business works- from managing inventory to advising on pricing- especially in the digital age." he says. So in addition to hosting rotating exhibitions for his stable of international artists and occasionally offering up blue-chip secondary market works by icons like Andy Warhol, Picasso and Robert Rauschenberg, he also collaborates in unique alliances with about 45 independent artists, Doug Menuez, who followed Steve Jobs and a tribe of innovative entrepreneurs for more than 15 years to document the ways in which these visionaries changed our world. A selection of his photographs are on display at the gallery in an exhibition called Fearless Genius from January. 11 to Feb. 4.